Add this Choice 5" unwrapped black stirrer / sip straw to your venue to ensure your customers can conveniently stir and enjoy their hot beverages! The straw features a single barrel for easy sipping and has a sleek, black color that will add a classic touch to your coffee shop, diner, or restaurant. Plus, it comes unwrapped, allowing for quick placement in piping-hot coffees, teas, cappuccinos, and hot chocolates without the hassle of uncovering traditional paper and plastic wrapped straws or picking up dropped wrappers within your facility. The Choice stories are a great addition for my beverage bar. We use them for coffee and hot chocolate. I really like them as they are disposable and we save on dishes. A must have item. We actually use these for bar service. We use a taller glass for mixed drinks and the 5" stirrer falls in the glass. You can use it to mix in the sugar, milk or cream into your coffee. Also works for tea. It’s economic and many come in the pack. These stirrers are quick, easy, and match the description for our customers to use at our coffee station. We can also use them for other stirring if needed. These coffee stirrers/sip straws are great for stirring and sipping. I used these to sip mixed drinks at an event and they worked very well. I would definitely recommend these for purchase. These stirrers are just ordinary stirrers with basic quality you’d expect. However, we would like them to be a bit longer. Some of our customers like to keep the stirrer in the cup after putting on the lid to sip coffee. We try to get products that are versatile. We use these as coffee stirrers and also use them in the bar for mixed drinks. They are the perfect size. These are great straws. I used them for mixed drinks. They are a little short for tom collins glass but perfect for most other glasses. I would purchase again. You get a lot for the amount of money you spend! They are great quality stirrers and i couldn’t find any at the store like this! These are the perfect size straw for beverages that are hot is to access at great price i would continue to buy more in the future. I highly recommend these. What a great deal for so many straws! You cannot beat it! I would never buy these anywhere else! This is such a great find and truly a necessity. A really nice style 5" unwrapped coffee stirrer that is terrific quality and great for our coffee bar. The stirrers are also great for cocktails as well. A nice size and great case price. These choice unwrapped sip straws are perfect! I will be using these for cocktails at my wedding, paired with the choice 12 oz thin plastic wall cup. The straw fits perfectly with this cup. I wouldn't use this size straw for any bigger cup size, therefore if you have 16 oz cups I would go with the 7 inch straws. Overall, very good product and very affordable. I am so happy with my purchase. Great product! Good quality, perfect size and great price. Delivery was quick and on time. Definitely will continue ordering from Webstaurant. These straws are perfect for our cups and ice bottle service set ups. They serve their purpose and stir very well. Will buy more of these. Perfect for drinks and coffee. It also looks classier. The length too is okay for most glasses or cups. Awesome price. Can't wait for our next purchase. These stirrers will melt very easily in hot coffee or water and prove to be ineffective. They also only work for 12oz. cups. We have noticed that wooden coffee stirrers work better. We ordered these Choice 5" Black Unwrapped Coffee Stirrer / Sip Straw - 1000/Box for the cocktails at our wedding. They worked great and fit well in the caddy. I searched everywhere for a reasonable price (and shipping cost too) for bulk straws for my outdoor function! No where was cheaper than Webstaurant! I will be returning for all my future party and bartending needs! Standard coffee stirrer we use in our bakery. Quality is sufficient. Large pack size is helpful and low cost is great when adding in paper costs for to go coffee. Outstanding coffee stirrer and drink straw. You want find a better priced straw than here on webstaurant. 1000 should last for quite sometime. Definitely recommend! I love these coffee stirrers. They are five inches. Come 1000 in a pack. Affordable and durable. Great for parties ! And you throw them away ! These straws are nice they fit nicely in the caddy I bought from here and the black is nice and sleek. Helped make my coffee station stand out. Great stirrers, handles the heat when it comes to drinks and the size fits most coffee / tea cups. It's very inexpensive and you can only use one straw rather than two because it's longer than regular stirrers. I am super happy with the quality of the product for the price! These straws are great for stirring my mocktails, and just as good for drinking them too. Essential for any bar station and at this price I was are able to stock up and save. Classic look and great price, will order again. These are a necessity for any cafe, so it is wonderful to be able to find them in bulk. Buying them 10,000 at a time will be a great way to save! Worked perfect for our needs and super quick on the shipping. I would recommend these to any of our industry friends and those needing quantities in bulk. These stirrers aren't anything super special, and they work well for a 12 oz. cup of coffee but not for anything larger. That said, they're not super flimsy (they won't melt in your coffee), I'm going to use them for cocktail stirrers, I think they're perfect for that. Bar essential, and at this price you are able to stock up and save. I have replaced straws and mini stirrers with this product, to cut down on waste. This coffee stirrer straw is a perfect addition to your coffee bar at the workplace. This coffee stirrer box of 1000 comes unwrapped which is perfect for helping to save the environment one unused-wrapper at a time. Used this product for coffee stirrer and cold beverage stirrer. Worked great in 8, 9 and 12 ounce cups. It worked great for both. Great value! Would definitely buy again! These straws are the perfect size for coffee to go cups. I use them with 8-12 ounce cups. These black straws look great when you use them with the Choice black lids and the coffee bean cup sleeves…great job coordinating products Webstaurant! These straws work great. They are very durable and hold up well. Customers love them and they look great too. Would recommend them for use. We set these up on our coffee bar. Great for coffees, hot chocolates, espressos, cappuccinos and more. Wee couldn't be more satisfied with this purchased. A very inexpensive and great quality unwrapped coffee straw that works great in our dispenser. A great tool for mixing your sugar and cream into your coffee. The Choice 5” Black Unwrapped Coffee Stirer or Sip Straw is very functional for both as a straw and stirer in one. It has a sleek black color that suits well in cocktail and juices as well. Don’t waste your time dirtying another spoon or napkin! These stirrers will replace the need for both, you can stir your coffee and toss it when you are finished. we use these in our cocktail drinks and they work great. they are technically a straw because they have a hole through the middle but the plain black color makes it look upscale. work as expected. Looking to save money on coffee stirrers. This product, also known as a sip straw, comes in boxes of 1000 and is very inexpensive. Get this product shipped right to your door. Great coffee stirrer and every better price. Any place serving coffee should have these stir sticks. We will recommend to everyone and will buy again. Although these are typically used for coffee stirring, we usually cut them in half and use them as short cocktail straws. They are quite durable. These small stirrer straws are perfect for a café of bar looking for a short 5" straw for mixing drinks or as a sip straw. full case of 10,000 straws is a great deal. We ordered the bulk box of 10,000 to save on costs and were pleasantly surprised to find that they shipped in 10 smaller boxes of 1,000! Great for storage and keeping track of inventory. The stirrers are good quality and the black color is nice. Not sure how you could go wrong with these. They are uniform in quality. Also they have an appropriate stiffness to function well as coffee stir sticks. Love these we use them all the time and not a bad price for what your getting. We also food that its cheaper to by these and cut them when doing cocktail-drinks. Great coffee stirrer or sip straw. This is the perfect size for coffee fanatics. You get a ton for your money with these. A staple For any restaurant! The Choice 5" Black Unwrapped Coffee Stirrer / Sip Straws are great to have in our home for coffee or soda. They are a really good deal and definitely worth the low price. I am very happy with my purchase and highly recommend. They work well, never had any problems with them. They do the job, cost is great and the quantity to price is great, i do not use many though so i have had the same box for 3 months. Even more cost efficient for me as chain stores charge this price for around 100 compared to 1k here. Great little straw. You can't beat the price. They are very small and work better as stir sticks but you can also drink out of them. Look best in a rocks glass because of their height. I have been purchasing these straws for over 2 years. Great price and durable straw. We go through a case every 3-4 weeks, just right for the pocket book. A great quality stirrer that is great for mixed drinks. The stirrers are a great price and a great quality for our bar. A great purchase once again. I use these not only as a coffee stirrer but as a sip straw. Conveniently packed in boxes of 1000. I have never had a complaint against them. They do exactly what i need them to do. I would recommend. Very quick shipping and a great price. They do the job and very sturdy, I might go with the longer one next time I order. This is the cheapest you would find these straws. They did the job and well worth it. I have straws for a lot of my events now. Great straws. For the price you can't possibly go wrong. I will be using them for the bar at my upcoming wedding reception. This is a great option. We purchased these for coffee and to be used with shorter rocks glasses at our wedding. They didn't melt in the hot coffee and were the perfect height to be used with our 9 oz tumblers. Excellent value for the price. These are my favorite stirrers for coffee mugs or for small cocktails. The black colored ones look so much better than the white or neon. The only thing is they are a little thinner than some of the other stirrers. This one thousand pack of Choice five inch unwrapped coffee stirrers is perfect for us. They fit well in any standard holder and at such a great price you can’t not order them. I appreciate they are unwrapped and will order more for sure. Well-constructed and I recommend to any coffee barista or want to be coffee barista. These are good quality, standard coffee stirrers. We will use them as sip straws for mixed drinks. They fit perfectly into the 9 oz plastic tumblers we got. I used these for a wedding reception for cocktail drinks and heard no issues. The size was perfect for the cups and served their purpose. I am ordering another set. Can't beat the price on these when you do a lot of breakfast catering events. Convenient, small box package. Not a flimsy product. It will stir your sugar and cream into your beverage well. Even works with thicker honey for tea. 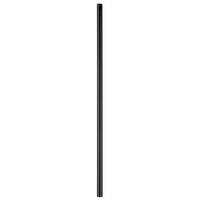 A wonderful quality unwrapped black coffee stirrer that is great for our café. They fit into our dispenser and customers can grab them at their own convenience..
What a great price! And the shipping was fast. We can't wait to use these on the coffee bar we are setting up at our daughter's wedding reception. Handy little stir sticks for coffee and tea, or sip straws for cocktails. These come unwrapped so they are easy to grab and restock, and very affordable. Don't bend and aren't as flimsy as others. These will come in perfect for both our mixed drinks and coffee at our wedding. These were the most cost effective price I have found for the quantity. Perfect for use to either stir coffee, or mix up drinks/cocktails. The price on Webstaurant store beats all local distributers. Perfect product and perfect price. Mixing a delicious cocktail can't be better off without using a beverage straw they work great and are the best price you can buy online I highly recommend you buy multiples. great quality straws that comes intact. We use for the cocktails so customer can sip on drinks with out getting too much of the pulps from the drink. We use these straws in our 7oz. mixed drink glasses. I like that the color matches the rest of our product. They are sturdy for mixed drinks and child size sodas, if you use 2 at a time. Why buy small quantities of coffee stirrers from your local distributor at a crazy high price when you can buy a larger quantity at a tremendous cost savings. This item was originally for use to stir coffee, but I used it for drinks for my sister's 21 wedding anniversary. This item is strong, reasonable price, and the right height. I love these coffee stirrers. At our bakery we bake mini stacked cakes and we like to use these to insert in the cakes to stabilize them. They're thinner than normal straws which we use to our benefit. These 5" black unwrapped coffee stirrers are great! They are nice and thin they stir nicely and don't break easily. Great for short glass mixed drinks as well. This straw is super versatile for both mixed drinks and coffee or tea alike. The straws come unwrapped so you can quickly grab one and go! These coffee stirrers/sip straws were just what I needed for my hot chocolate bar at my wedding. Since kids were present, they were a good thing to have so that kids didn't make a mess or burn their tongues for drinking their hot chocolate too fast. Perfect coffee stirrers for our do it yourself coffee bar. Sits nicely displayed in a caddy attached to our cups/lids/sleeves station. Great product, great price! I'm so happy with the price and quality of these coffee stirrers the 1000 pk box is such a great value you can not beat the value. You can use them as a straw for sipping but we love them for our coffee. About the straws to be the cocktail short glass straws for the bar. At first I got complaints from gas not wanting to drink from two little straws and wanted just one big thick straw. Forever no guess don't seem to mind it and they're working out great. I purchased the Choice 5" Black Unwrapped Coffee Stirrer / Sip Straw - 1000/Box for home use. The quality is great and the price is very reasonable. Highly recommend! For the price that you pay.....this is so worth it!! The quality of this product is great. Always have enough one hand for my events. This is 5 inch stirrer/sip straw by Choice brand. This stirrer/sip straw does the job. Comes 1000 in a box. We give 4 stars. Ge it from here, the Webstaurant store! They are what they are: a dependable product at a very reasonable price. We use these in liquors served on the rocks, we use them for coffee, we use them for hot tea....Useful in hot and cold applications. Sweet 'n simple coffee stirrers. They're exactly what you expect. They are unwrapped, as it says, so that makes things easier with less waste. 10,000 is A LOT, so we'll have enough for months and months to come. Great price. These are pretty good little coffee stirrers. A bit on the short side but you do get a thousand of them. They do seem to soften up and become flimsy when you submerge in a hot enough beverage for a long enough time. They can also be used to sip your hot coffee or tea. These stirrers are just as I Imagined them! They are so convenient. I couldn't find this quantity and cost anywhere else. Such a great value. These straws are great for coffee, tea, stirring drinks and/or cocktails. Large case of 10,000 makes them very economical and worth the price for sure. Great stirrer for coffee or tea. It is not individually packed but it is ok for product of this price range! Great for office use! I wanted some little straws for the hundreds of kid's hot chocolates I was serving. Kids love the straws so I'd say it was a successful product! The adults used them as stirrers too, which was fine. Great mini straw stirrer. 1000 in a box and plenty to spare for that morning coffee. You can use these for all of your kind of drink stirrer needs. Good quality coffee stirrer and does not melt when used. Easy to dispense from a bottle with the top cut. And a great value for the price! Love the colour length and everything about these. Prices are unbeatable for the quantity provided. Package cam intact and on time. will order more of theses stirrers. Best deal! Since I bought this stirrer for the first time, it is being the only one I use for my business. It is high quality and great price. It's a stirrer, it's a straw. Sturdy and functional as both with very good pricing. This is one more winner from webrestaurantstore.com that's for sure! These are such a convenient way to have a cocktail party or to have people over for coffee. I am always running out of spoons to mix with, and these stirrers really save the day. A great buy here, too. Great price on these quality stirrers. We use them for tastings and in cocktails and they are a perfect size and look great in drinks. These little stirrer sticks are so inexpensive!!! They are good and sturdy and do their job well! Little and dispense perfect from #271SSDAC! Great buy! I have already made my second order of these straws after our bar being open for two weeks. Exactly what we needed for our short drinks! The price is fantastic on these stirrers. We use these as stirrers for coffee to go. Also work great us cocktail stir sticks. Can also be doubled up and used as a straw. These stirrers work great in any hot drink. Hot coco, coffee, tea, whatever it is that you like to drink, these are GReAT. I love that it's not only a stirrer but a straw as well. They are sturdy and get the job done. Great product. Not sure what I can say about these stir sticks, other than they are the perfect size stir sticks for coffee cup of different sizes. great price. This product has proven to be exactly what was advertised and expected. They work as intended and the pricing on the product is great. We will be ordering again when the need arises. We go through a lot of these at our coffee shop and you can't beat the price, quantity, and quality. Would recommend these to others! Item came exactly as described and perfect for what I needed them for. Absolute great price for the quantity and the quality is very good. A very good value, and the perfect size for our rocks glasses to add as a stirrer. Packaged well, will definitely use these straws again. Your standard stir stick. Works well with coffee drinks or mixed cocktails. Sleek and simple, but does the job. Sturdy and reliable. We use them for kids drinks also. This sip stirrer is great and works with both hot and cold drinks. Works well with coffee mugs, Old Fashioned glasses, and Double Old Fashioned glasses. These are very nice 5" black sip stirrers. They fit beautiful in most coffee organizers. With the price for a large box of these being so good it would be good to pick up several boxes. Not only can you use the Box of 1000 5" Black Sip Stirrer for coffee, but you can also use with a 12 oz cup to drink eggnog. It's a cheap and inexpensive way for the kids to drink in the holidays with Eggnog. These are great stirrers, they do not bend while you are stiring your coffee. I have used the same stirrer for 3 mugs of coffee, with no problems. These stirrers have not only saved me financially they have helped us to reduce my recycleable trash. Making these a priceless addition to our everyday life. These are a perfect size for stirring beverages or to use as a straw. We use them for everything. Compact and durable. Excellent value for a multi use item. Good size sip stirrer for a small cocktail, I will need to get some longer sip stirrers for the 16 ounce tumblers and the coffee cups. Wish there was a combo box with both or a 6 inch sip stirrer in black. Can't beat this price. You get a great deal of these stirrers for the price and they are the same thing you see at any coffee house. They will be great for my upcoming wedding. Inexpensive and easy to get. It's hard to mess up something like a small straw, and these seem to be as good as any other ones. We Ordered 5" Black Sip Stirrers to accompany coffee cups. Stirrers are good price. Holds up well. Will surely buy more or future event use. The sip stirrers look and preform as expected. Nice, convenient packaging for storage. Very reasonably priced at half of what my previous supplier was charging! I bought this for restaurant and bar. Just love it's black color instead of boring red color. The price also very cheap compared to other places. It just worth it and save money. Thank you. These sip stirrers are a must-have at any establishment serving coffee, hot cocoa, or other hot beverages. We had customer requests, so we found these here and now our customers are back to their happy selves. I love using these stirrers at all my events. They can be used for formal or informal events. Everyone wants to know where I got these from and I direct them to this site. Great straws for cocktails! Our bartenders love these as they aren't flimsy but are extremely versatile. We use these at every bar event and have never had a complaint! The black sip stirrer is a classic bar accessory. They look great in drinks and are useful to stir layered cocktails. They are super affordable and easy to store. These stirrers are perfect for serving with our rock glasses. They are the perfect height and they can be used as a straw as well. Great to have at a bar an a must need for most drinks. Perfect way to send a drink of to a customers an never had a issue with them. These are your standard black 5 inch stir straws for coffee at church and mixed drinks in the bar. Seem to be good quality at a good price. Got this today! Received as expected. Would be using this for cocktails and hot beverages. You can't beat this price! Thanks Webrestaurant for another inexpensive but good quality product! Yes, these are your basic black stirrer, which makes cocktails pop more than the standard red stirrer, by you just can't beat the case price on these here. These are basic stirrers used for hot or cold beverages. Can be used for coffee, tea or cocktails. The price is unbeatable for a box of 1000. Good quality product. At our non-profit fraternal organization, we strive to save money, which in return helps benefit our members. We save money by getting this great deal on the 5" Black Stirrers for a great price per box and 10 boxes per case. We use them in all of our mixed drinks! Thanks for offering this wonderful deal in the bulk supply! We'll be sure to keep ordering these from the Webstaurant Store. Why pay more anywhere else? These are exactly what I needed! They are great for coffee stirrers for traditional-sized mugs as well as drinks for cocktails. Will purchase again and again! these 5" black stirrers are a must have for any place that sells drinks. work great and priced to sell. and they shipped super fast. great value product. Great stirrers and they are good for all types of drinks, I have had customers use them in their hot tea, at a price like this buy a few boxes. I love these little stirrers. They are the perfect size and they hold up well. Best deal I can find on these and I will purchase again soon! Great price for bulk quantity. Can't go wrong with these because they are the best price I have seen so I will be buying these again. We use these in the break room mostly for our coffee. Very nice item and priced just right. The length is just perfect for a coffee cup. I ordered these to use for my home bar. I am so glad that I ordered them. Now I no longer need to put a spoon out for my guests to stir their cocktails. This makes mixing cocktails a breeze and eliminates the spreading of germs by not using a cocktail spoon! These 5" black stirrers are a great value. They are made really well, not flimsy. I purchased them for a wedding reception nad couldn't be more happy with this product. These black stir sticks work great with our mixed drinks. 5" is just the right size for drink on the rocks or with one mixer. I really love these stirrers for more formal dining occasions and get-togethers with friends. They really add a nice touch to cocktails! They are great for coffee too! Great value. Great product. It's just a case of stirrers but they feel good in the cup and the packaging allows for easy storage under the counter. This is a must have whether you are serving mixed drinks or coffee. Perfect length for a standard size rocks glass or 12oz coffee cup. Very good price point. Nice standard type black bar straw stirrer. They look good and professional at the bar, and of course Webstaurant has great prices on these items! These are always a hit at my house parties. They make my mixed drinks look high class. For a few pennies, they add a nice touch. These are great little stirrers. We go through a lot of them and have no complaints whatsoever of this product. Thanks, Webstaurant, for the low price. as always, when we need buy some supplier for our restaurant, webstaurant is always our first choice to find everything in one place for best price. Essential stirrers -- you can't do without them. These stirrers are the workhorse of beverage service. They can be used for hot drinks and cold, coffee or cocktails. Great for mixing or sipping a drink, you can't get by without them. These are good stirrers and fit well in small glasses. I prefer straws on the same length and prefer other colors than black. This is still a very good product at a great price. You will not find a better deal for these small drink stirrers! They also come in longer lengths for different uses! They work great for sampling a mixed drink to check the flavor combination!! For your events that have smaller portion sizes these straws are great. Works well with cups 6 oz. Adds that professional look to the straws and comes in a nice black color. Great product and just the right length for drinks in shorter glasses. These are usually hard to find in my area. I will buy these again. As a product these stirrers work very well but recently after hearing suggestions from our customers we switched to the wooden ones and I've found that they work. this black stirrers alwas will be in my events, as a catering company I know that this is the perfect touch for your mix drinks.